The Republican National Committee’s communications department poked a little Easter fun at President Obama Saturday. It’s a reference to Mr. Obama’s recent “hot mic” moment with Russian President Dmitry Medvedev on the subject of missile defense. 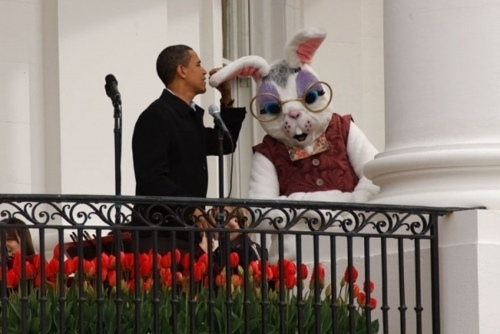 The photo actually depicts Mr. Obama trying to use “rabbit ears” as a microphone while technicians worked to fix the real microphones on stage.